The client’s demand is the regeneration and seismic strengthened of the kindergarten.In short periods of design and construction, YDS Architects intends to re-incarnate the spaces by partial renovations. Under restricted time and costs, their solutions are mainly on two nursery rooms, gyms, lavatories and corridors. By putting the small extension volume with one tiny wall to the existing buildings, the Is structure score rose to 0.95 from 0.78(safe scores are over 0.6). It contributes to the right balance as well as the improvement of the lavatory. This is a renovation for kindergarten. The design theme was not only to make this kindergarten seismic strengthened but also to reproduce it as a New Misora kindergarten. After the renovation children said ‘Our kindergarten became castle!’ or ‘In which color the spaces become next time?’ , because the colors and materials are renewed during the summer vacation. This is an attempt to make new values and spaces for kindergarten by partial renovations under the strict restriction. Lavatories in kindergartens are very important spaces for kids, especially for infants of three to four years old.The lavatories of this kindergarten are small,so teachers want to have more spaces for toilets and showers. Considering the schedule of subsidy and the cost,our scheme was extending the building.By this small extension, the kindergarten has been tremendously reinforced and the lavatory for infants is bigger by 1/3, more toilets and a shower has been installed. Design started in September 2014 and finished in June 2015 in Tokyo. Construction started in July 2015 and finished in August 2015 in Chiba,Japan. 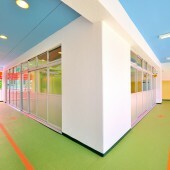 The corridors of the kindergarten are like Engawa spaces which are semi-outdoor spaces typical to Japanese architecture. The intention is to make these spaces enlivened . Previously the surfaces of the corridors are exposed concretes. YDS Architects put the soft cushion to the surface and painted with green which remind us of grasslands. The ceilings of them are painted with blue like the sky. 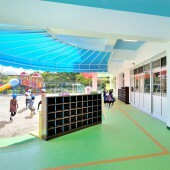 The practice aim to make them vigorous and comfortable spaces for kids. The design started off by closely examining the existing structure and researching several projects of seismic strengthen of schools. Teachers want to add as little walls as possible in order to keep the environment for kids, so we designed narrow walls to add them. After comparing different materials to stick on the outdoor corridors, vinyl cushions of colors which reminds the kids of nature became the key considering cuteness and safety. After The Great East Japan Earthquake, schools and kindergartens are especially expected of high earthquake resisting. This project is under strict restriction of cost and time.The period of design and construction are both short. We intended to small extension to make it better functional as well as strong. Extensions of less than 10sqm in specific district,no application is needed in Japan. Adding 8.9sqm to the volume and making a small wall resulted in making it specially strengthened. Visit the following page to learn more: http://www.ydsaa.net,http://www.catv296.ne.jp /~misora/index. Misora Kindergarten Renovation Kindergarten by Yoshitaka Uchino is a Nominee in Architecture, Building and Structure Design Category. Misora Kindergarten Renovation Kindergarten by Yoshitaka Uchino is Winner in Architecture, Building and Structure Design Category, 2016 - 2017. 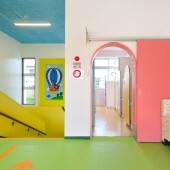 · Read the interview with designer Yoshitaka Uchino for design Misora Kindergarten Renovation here. 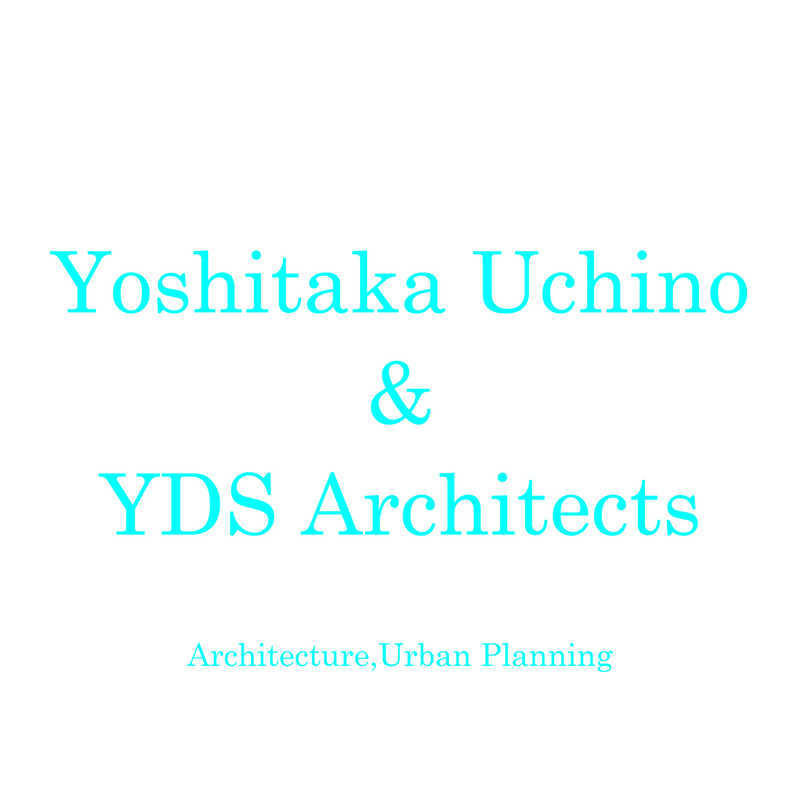 Did you like Yoshitaka Uchino's Architecture Design? 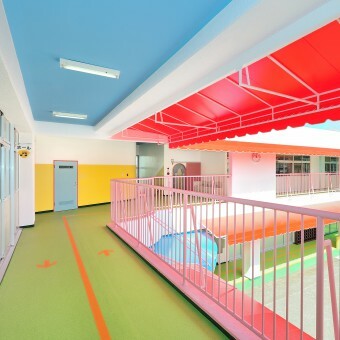 Did you like Misora Kindergarten Renovation Kindergarten? Help us create a global awareness for good architecture design worldwide. Show your support for Yoshitaka Uchino, the creator of great architecture design by gifting them a nomination ticket so that we could promote more of their great architecture designs.